Osatsu’s Ama fly through the skies of Europe! Osatsu’s Ama get to share some insight on their ancient way of life in Finnair’s inflight magazine “Blue Wings”. After over a year between the original interview and the finished article, Osatsu’s Ama get to share some insight on their ancient way of life in Finnair’s inflight magazine “Blue Wings”. Osatsu is quickly becoming the last place in Japan to see the Ama in numbers heading out to brave the unforgiving sea. 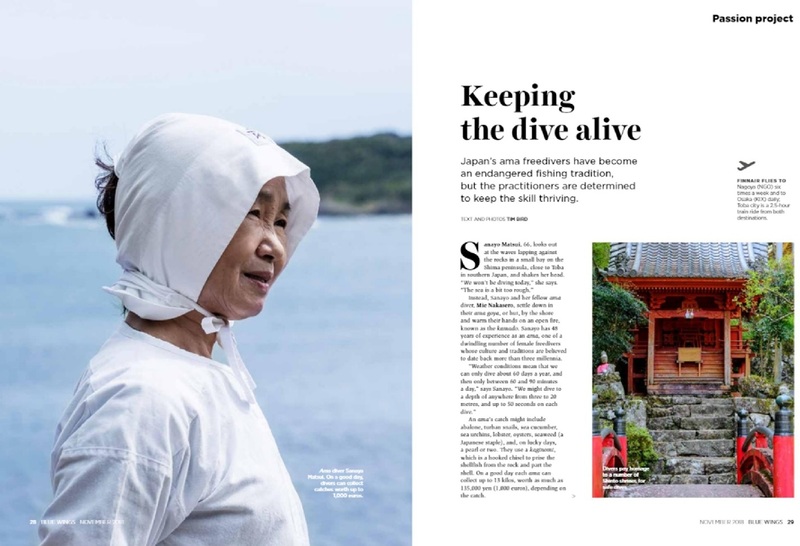 All of the women featured in the article can be found working at Osatsu Kamado after their diving sessions have finished and are always brimming with energy. Osatsu has many Ama-run accommodations and cafes, an Ama information centre, and several Ama-related Shinto sites. If you are curious about Ama culture and would like to meet some of the ladies in person, come visit Osatsu and catch an unfiltered glimpse of this traditional way of life. Copyright © 2016 相差海女文化運営協議会 All Rights Reserved.